Whether you’re on the “love it” or “forget it” side of the great Valentine’s Day dining out debate, there are plenty of other date nights to enjoy. Here are some spots you may not have heard of that are worth investigating. CONCORD – If a visit to Concord’s Brasas do Brazil is on your date night radar, I have two words of advice: pace yourself. 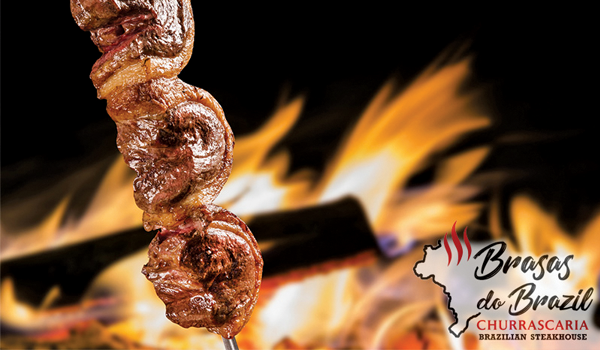 It’s a fun and unusual dining experience, making the trek to the all-you-can-eat Brazilian steakhouse well worth the trip. Just check out the menu online and have a game plan going in so you don’t overdo it. My date and I opted for the full churrasco dinner, which showcases 15 to 17 rotisserie-grilled meat options that servers slice tableside, as well as an epic salad and hot bar. If you’re a fan of beef, I highly recommend the flank and the New York steaks. Both were tender and marinated to perfection. We added jumbo prawns to make a mini surf and turf meal. Try the grilled pineapple; it was a decadent surprise. Full dinner is $59.95 per person. Kids 12 and under eat for a reduced price. Open daily for lunch and dinner. Full bar. 1631 Willow Pass Rd., Concord. BrasasBrazil.com. DANVILLE – Aiming to give the oft-maligned Albatross a fresh chapter in its lonely tale, Danville’s new restaurant with the same name celebrates the bird capable of circumnavigating the globe in 46 days with an eclectic menu that will delight diners. The presentation alone is worth ordering the beets and greens salad, which features delicate, buttery red oak leaf lettuce and sweet roasted beets. 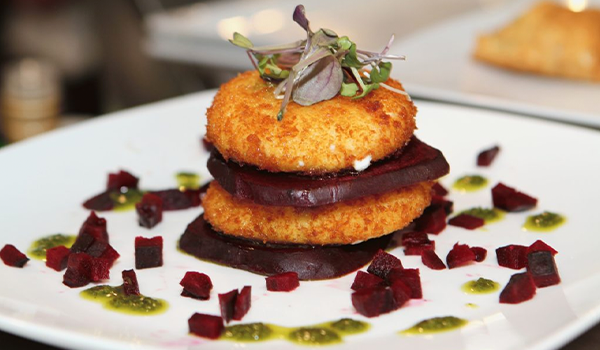 While it’s in season, don’t miss the Dungeness crab cake. You’ll notice that some dishes are available in small and large sizes. When selecting the strozzapreti, you will want the bigger size. Prepared with braised beef cheek, every bite of the hand-rolled pasta, which has a sordid history of its own, is better than the last. Entrées start at $17. Open Tuesday-Thursday 5-9pm and Friday-Saturday 5-10pm. Full bar. 312 Railroad Ave., Danville. AlbatrossDanville.com. PLEASANTON – When all you really want on date night is a burger, Pleasanton’s SideTrack Bar + Grill has you covered with gourmet selections that will make your mouth water. Before diving right in, check out the small plates. The Thai chili cauliflower “wings” were fabulous and will ensure you get your serving of veggies. Artisan burgers feature certified American-raised Wagyu beef. We chose the bacon burger with cheddar, grilled mushrooms and onions; then splurged with an order of crispy onion rings to go with the juicy burger. SideTrack also has a handful of sandwiches on the menu, including a Reuben, complete with corned beef, Swiss cheese, sauerkraut and Russian dressing. It was a definite home run. We didn’t try one, but the salads are beautiful enough to warrant a repeat visit soon. Entrées start at $13. Open daily from 11am. Full bar. 30 W. Angela St., Pleasanton. SideTrackEats.com. 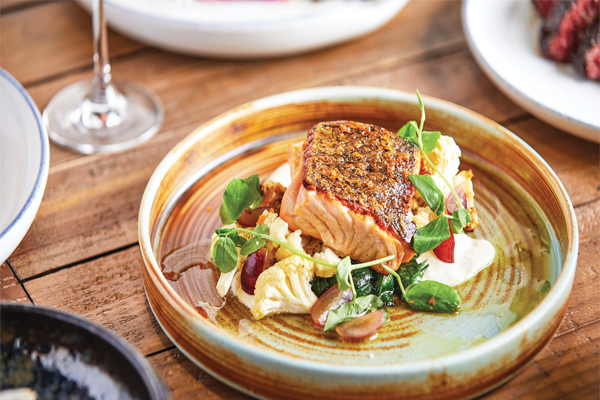 LIVERMORE – Gianni Schell embraced the need for change when he transformed Livermore’s Sanctuary Ultra Lounge into Rebel Kitchen and Libations. By the looks of the dining room on a recent evening, the permutation, highlighting an upgraded menu, was a success. Poke nachos are great for sharing. The tuna is tossed in a light spicy ginger sauce and drizzled with a tangy aioli. 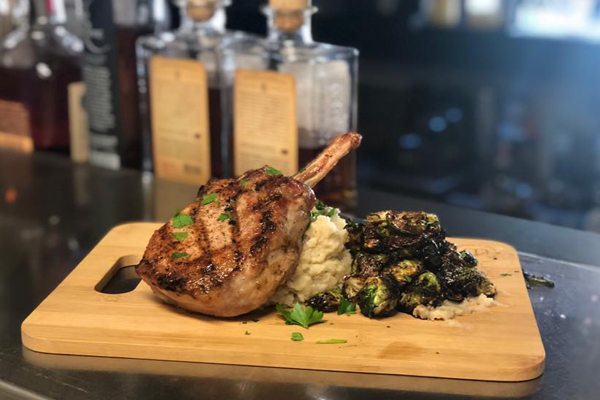 The French cut bone-in pork chop with garlic mashed potatoes and maple balsamic glazed Brussels sprouts was moist and flavorful. If you prefer something lighter, the bacon, pear, gorgonzola and chicken salad is a winner. Entrées start at $12.95. Open Tuesday-Saturday from 5pm and Sunday from 10am. Full bar. 2369 First St., Livermore. RebelKL.com. Janet Fazio writes ‘Tastes of Your Town’, a monthly feature on East Bay dining in the print editions of Your Town Monthly. A version of this article was originally published in the February 2019 East Bay editions.